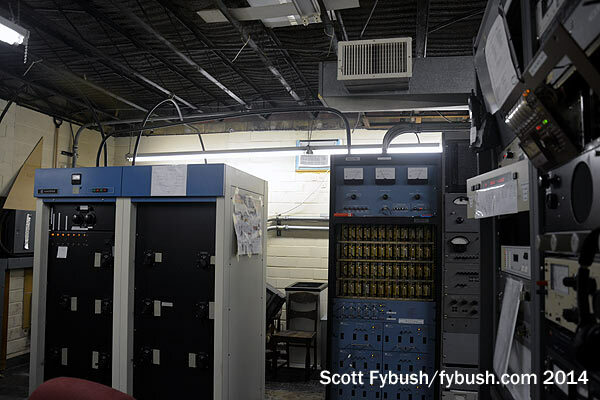 This week’s Site of the Week installment continues our July 2014 visit to northeast Ohio, where we wound down the Cleveland part of the trip with a stop at the city’s oldest radio station. 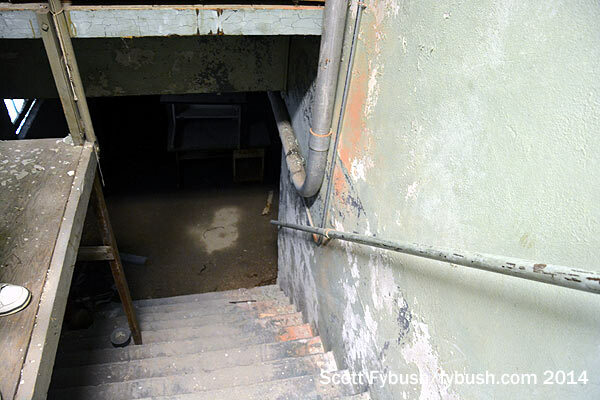 Now that you’ve done that – and learned about the connection between this site and the Austin ring transformer – let’s take a look inside, shall we? There are three buildings linked up here now, and the Art Deco building in front where the current transmitters sit appears to be somewhat newer than that. 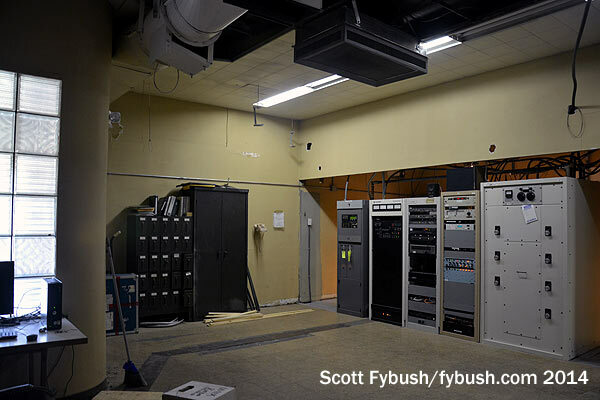 WHK’s AM transmitters sit just inside the front door, with a Nautel, a Harris, two racks of gear and a phasor all taking up rather less space than whatever must have filled this wall in an earlier era. WHK was an early adopter of FM in the post-war era, and under longtime owner Metromedia, WHK-FM (100.7) morphed into the legendary rocker WMMS. That station was home not only to some of the biggest programming names in radio but also some of the best engineers the industry has ever known, including Jim Somich, Frank Foti and Steve Church. 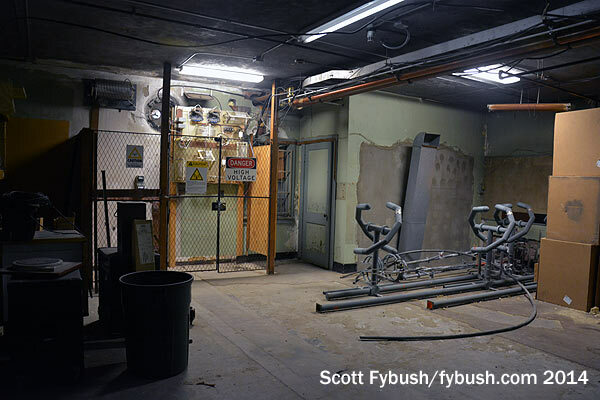 In short, a lot of radio history came through this room. The AM and FM signals stayed together under Malrite, which took over in 1973, but eventually went their separate ways. WMMS passed to Nationwide, then Jacor and eventually into today’s iHeart cluster. WHK’s 1420 signal was part of the great 2001 shuffle: Bob Conrad’s WCLV ended up with the 1420 facility and the standards format that had been on WRMR (850). 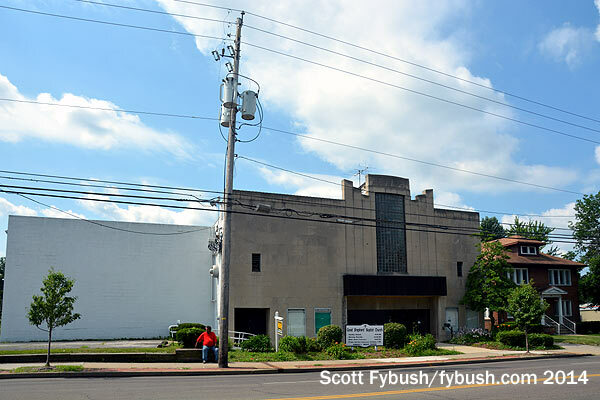 For a few years, this was WCLV(AM), then brought back the WRMR calls – and then went to Salem, which moved the WHK calls back here from 1220, installing the Salem conservative talk lineup here. 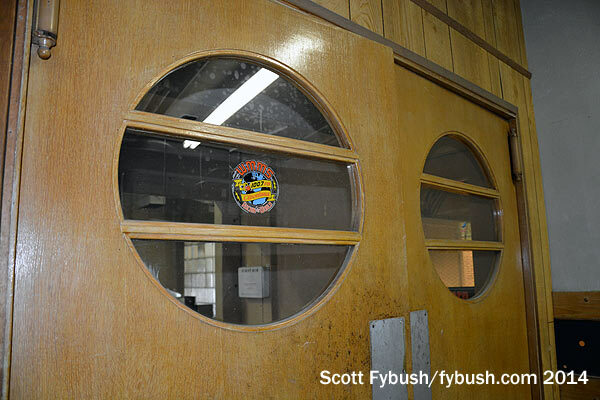 I suspect the middle building in this grouping, reached through a pair of really neat round-window Deco doors, was probably the original 1930 structure, especially because it includes the basement that James O’Neal mentioned in his Radio World piece. 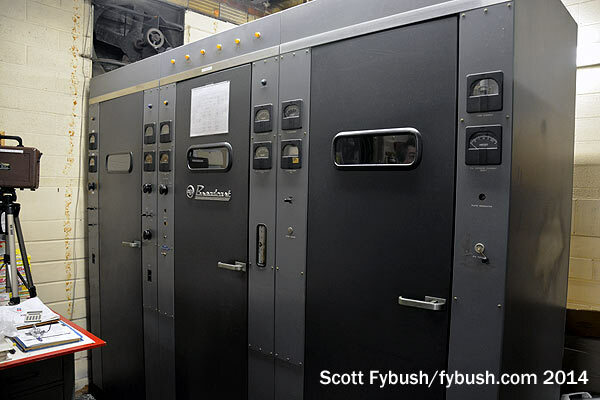 These days, the middle building is used mostly for storage, though it also houses the feeds out to the AM towers. 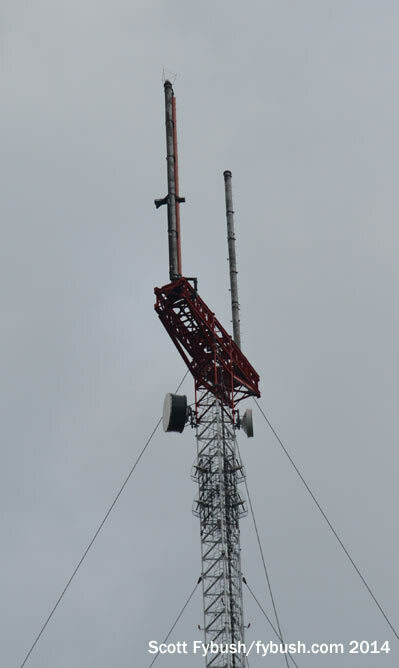 For WHK, this is a three-tower array, non-directional by day and using all three towers at night. 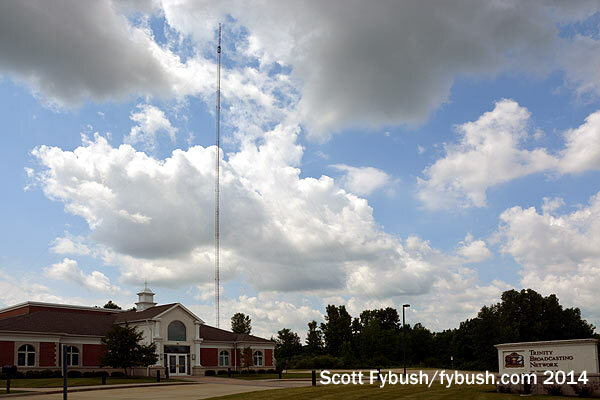 WMMS has its antennas on tower 2; at 412 feet tall, and a little over 600 feet above average terrain, it’s one of the shorter FM sites in town but still performs nicely. 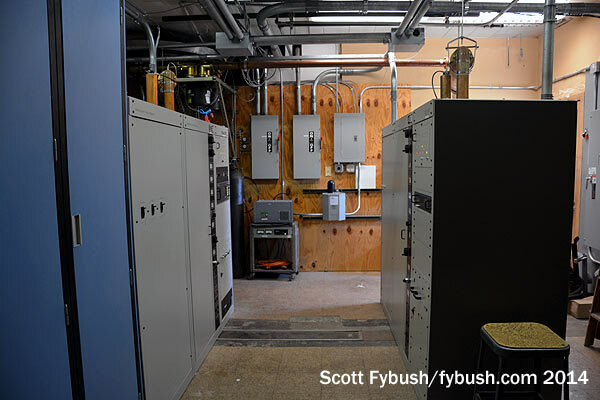 Inside the WAKR transmitter building, there’s a venerable RCA holding down backup duty adjacent to the phasor and the Nautel AMPFET that is WAKR’s main transmitter. 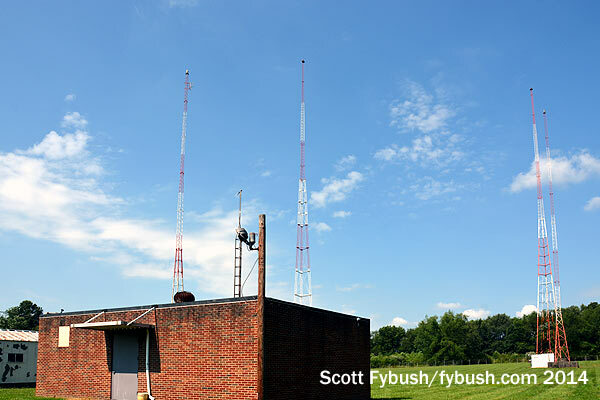 From the south side of Akron and the WAKR site down by the I-77/US 224 junction, we wrap up this week’s installment with a quick drive past the TV-FM tower farm on the west side of Akron. 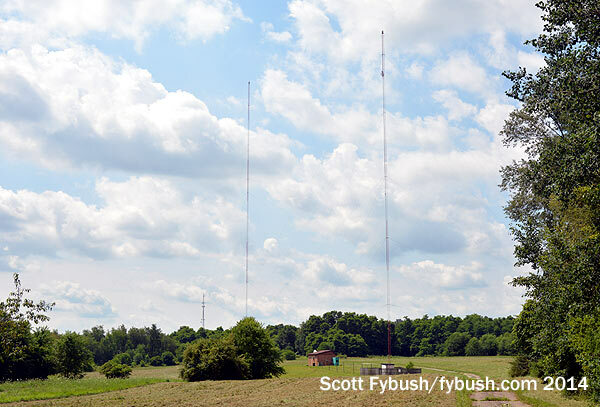 Off Cleveland-Massillon Road, that 925-footer shown above at left belongs to WEAO, the PBS outlet that took over channel 49 after WAKR-TV slid down to channel 23. Today, it’s shared by WEAO (half of “Western Reserve PBS,” whose other signal is down in Alliance, between Canton and Youngstown), Kent State’s public radio outlet WKSU (89.7), the University of Akron’s WZIP (88.1) and WAKR’s FM sister WQMX (94.9 Akron). And it’s behind a locked gate, so we can’t get much closer than the view above, alas. 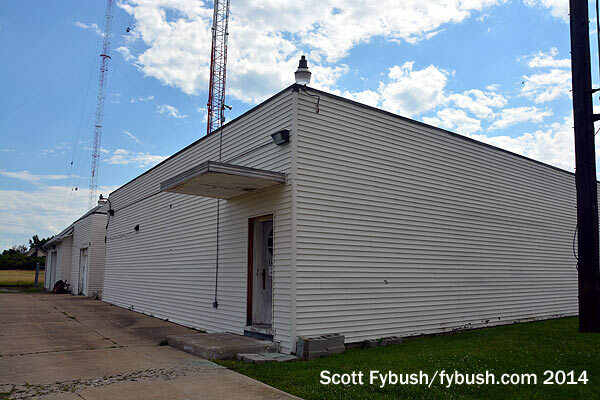 To the east, a drive up Driesbach Road takes us to the tower site that WAKR-TV built in 1967 to house channel 23 and what was then WAKR-FM on 97.5. 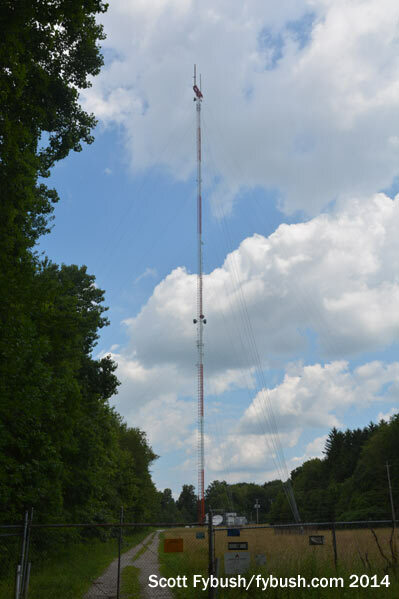 Today, this 959-foot candelabra is an American Tower site, home to ion’s WVPX on channel 23 as well as WONE-FM on 97.5, the Akron Public Schools’ WAPS (91.3) and two EMF-owned translators on 90.7 and 102.5. 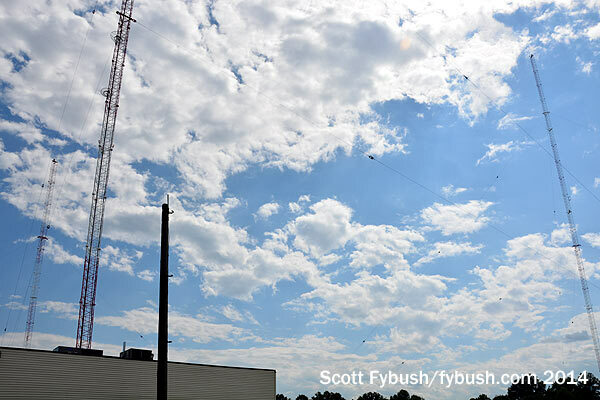 Two more sites out here round out our drive-by visits: heading west again on Route 261 from the WVPX/WONE tower, we find the newest stick in the area. Trinity Broadcasting’s WDLI (Channel 17) is licensed to Canton, but the DTV transition eventually landed it on RF channel 49 (WEAO, which had been the last occupant of analog 49, is on RF 50) and allowed it to build a new tower and big studio facility up here in Copley, near Akron, with better coverage up into Cleveland. And around the corner from the WEAO tower on Minor Road, we find the two towers of iHeart’s WHLO (640), which is where we close a circle that started at the WHK site up in Seven Hills. Back in the 1930s, when the FCC allowed AM duopolies, United Broadcasting (aka “Cleveland Radio Broadcasting Corp.”) bought a second station to add to its existing WHK. 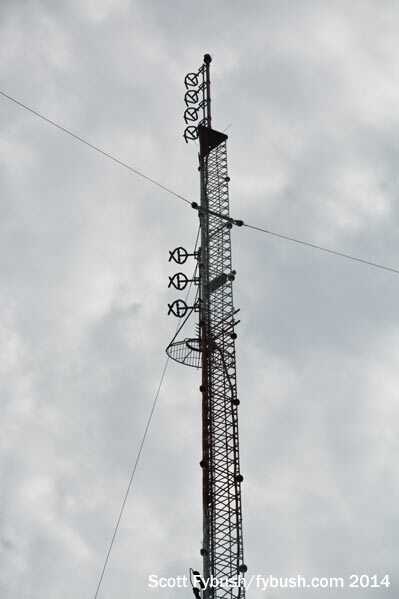 The former WJAY at 610 on the dial became WCLE, and “WHK-WCLE” operated as one entity from studios at Terminal Tower downtown and transmitters in Seven Hills. With 500 watts on 610, WCLE was a primary Mutual affiliate; WHK’s 2500 watts day/1000 watts night on 1390 carried NBC Blue and some Mutual overflow. The end of duopoly didn’t faze United: it kept WHK as its Cleveland station and moved WCLE south to Akron under new calls WHKK in 1945. But instead of operating on 610 from Akron, United pulled off a shuffle with its other Ohio outlet, WHKC in Columbus. That station had been a daytimer on 640, but it moved to 610 and went full-time, eventually becoming one of the biggest AM signals in all of Ohio under new calls WTVN. In Akron, meanwhile, WHKK took the 640 frequency that had been vacated in Columbus, and that’s where it’s remained ever since, today known as WHLO and carrying essentially the same iHeart talk lineup as sister station WTVN. Thanks to Ted Alexander, the Salem Cleveland engineering team and WAKR’s Al Hruska and Mike Ward for the tours!